White House Economic Council Director Gary Cohn and Treasury Secretary Steve Mnuchin on Wednesday laid out the administration's skeleton plan for tax cuts that was big on promises, but remarkably sparse on details, as President Donald Trump sprints to the Saturday finish line marking his first 100 days in office. 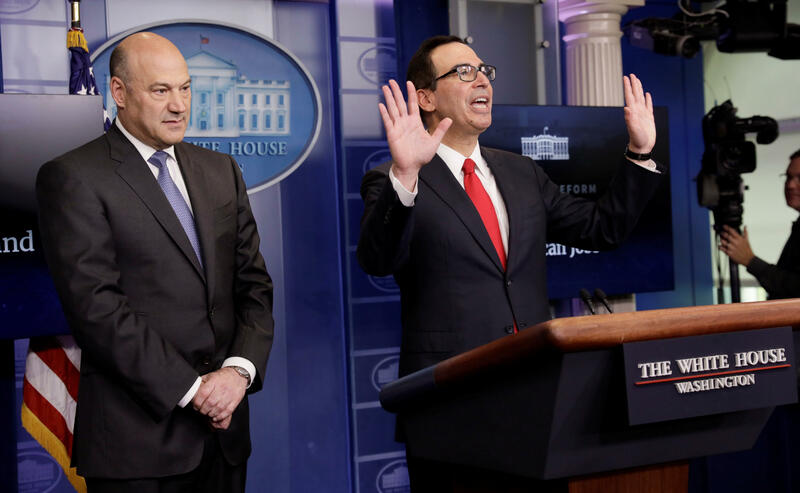 Cohn and Mnuchin said the administration is working with Congress on a plan that will cut corporate tax rates to 15 percent, down from 35 percent, and shrink the current seven personal income tax rates to three — 10 percent, 25 percent and 35 percent. The plan will also eliminate the death tax, alternative minimum tax and most personal deductions — including deductions for state and local income taxes, while protecting deductions for charitable giving, mortgage interest payments and retirement savings. The administration also wants to double the standard deduction for married couples to $24,000. Mnuchin and Cohn could not provide basic details, such as what income tax brackets would be, or say what a family of four earning a little more than $60,000 could expect to see in tax cuts. "We will be back to you with very firm details," Cohn said, although he and Mnuchin couldn't say when that might be. What do we know about Trump's tax plan? Cohn and Mnuchin insisted the plan wouldn't shrink federal revenue, but only offered vague economy theory to justify that position. "This will pay for itself with growth and with the reduction of different deductions and closing loopholes," Mnuchin said. Another piece of the administration's plan will cap capital gains taxes to 20 percent. The top rate is currently just shy of 40 percent. Mnuchin insisted the tax plan will benefit not just large corporations, but small-to-mid-sized businesses, too. Grover Norquist: Trump's tax plan is a "promise kept"
"The president is determined to unleash economic growth for businesses," Mnuchin said. Reporters questioned whether the plan would benefit Mr. Trump's own businesses, but Cohn and Mnuchin deflected. The announcement gave reporters another chance to ask about Mr. Trump's own tax returns, which he has refused to release. The president has said people don't care about his own taxes, but three in four Americans polled in January said the president should turn them over to the American public. Mnuchin said the president "has no intention" of releasing his returns. Democrats immediately seized on the plan's corporate tax cuts. "This scheme is a massive tax giveaway to millionaires, billionaires and big corporations at the expense of middle class families in Pennsylvania," Sen. Bob Casey, a Democrat from Pennsylvania, said in a statement. "This tax plan may help the wealthiest and the biggest corporations avoid paying their fair share, but it won't create jobs, increase middle class incomes or grow our economy." Democratic Sen. Jeff Merkley of Oregon also took issue with the corporate tax rate change.